There are certain things I never get tired of hearing. I never get tired of hearing Tom Cheek’s call of Joe Carter’s home run–the one that won the Blue Jays the World Series in 1993 (“Touch ’em all, Joe! You’ll never hit a bigger home run in your life!”). I never get tired of hearing the “Hallelujah Chorus” performed by a world-class choir. I never get tired of hearing the laughter of little children (Okay, this is a lie, and especially so when I hear kids laughing and giggling with hyperactivity in that witching hour before dinner). And I never get tired of hearing testimonies of God’s grace in the salvation of his people. 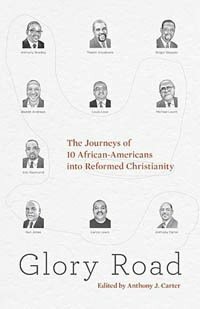 Glory Road is a book of testimonies that describes the journeys of ten African-Americans into Reformed Christianity. Now let’s first make clear that a journey to the Christian faith and a journey to Reformed theology are not the same thing. Yet in order to come to the Reformed faith (which I, like the men in this book, believe to be the most biblical explanation and understanding of the truths of Scripture) one must be saved. And ten times and in ten ways this book describes a journey from darkness to light and then a journey into a deeper understanding of Christian truths. Ten men each describe a miraculous work of God’s grace. They are: Reddit Andrews, Thabiti Anyabwile, Anthony Bradley, Anthony Carter (who is the Editor of the volume), Ken Jones, Michael Leach, Lance Lewis, Louis C. Love Jr., Eric Redmond and Roger Skepple. It struck me as just a bit of a surprise that, in the book’s opening pages, there is a dedication to R.C. Sproul (“To R.C. Sproul. When God inspired 1 Corinthians 15:58, we believe he had men like you in mind.”). But as I read these testimonies, time and time again it was Sproul’s name that appeared. Often the men would be saved and then, a year or two later, when searching for something more than the expression of the faith they were part of, they would find a book or radio program or video series featuring Dr. Sproul and in his teaching they would find a whole new faithfulness to Scripture. Their eyes would be opened to grand new vistas. It was also interesting to observe how often and how prominently just a few names appear in these testimonies–names like R.C. Sproul, John MacArthur and John Piper. These men are in many ways considered the “old guard” of the “new Calvinism” and in a book like this it becomes clear why that is. Long before Calvinism was the phenomenon it is today these men were holding firm to the Calvinist distinctives and teaching them to others. This book stands as a testament to their faithfulness and, more, to God’s faithfulness through them. As I said earlier on, I never grow tired of hearing accounts of God’s work. And this book, drawing from a very clearly-defined demographic, describes ten such stories. It is a remarkable read because every story of such acts of grace is remarkable. Read this small book to be encouraged at God’s great grace. Book Review – What Is Reformed Theology?